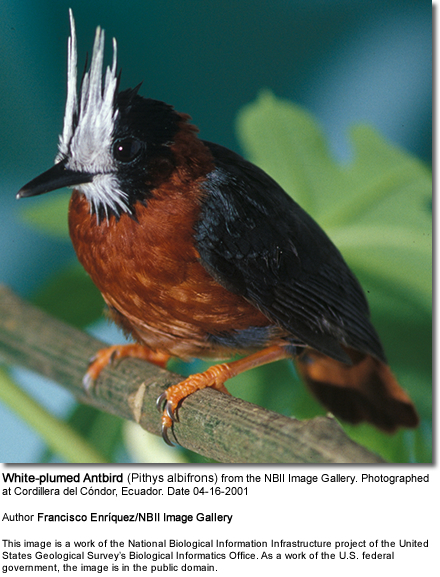 The antbirds are found across subtropical and tropical Central and South America, from Mexico to Argentina. This genus consists of more than 200 species, known variously as antshrikes, antwrens, antvireos, fire-eyes, bare-eyes and bushbirds. Most species live in forests, although a few are found in other habitats. They are diurnal, feeding, breeding and defending territories during the day. They are generally small birds with rounded wings and strong legs. They have mostly sombre grey, white, brown and rufous plumage, which is sexually dimorphic in pattern and colouring. Some species communicate warnings to rivals by exposing white feather patches on their backs or shoulders. Most antbirds have proportionately large, heavy beaks. Several genera of antshrike have a strongly hooked tip to the bill, and all antbirds have a notch or 'tooth' at the tip of the bill which helps in holding and crushing insect prey. The two genera of bushbirds have upturned chisel-like bills. The plumage is soft and not brightly colored, although it is occasionally striking. The colour palette of most species is blackish shades, whitish shades, rufous, chestnut and brown. Plumages can be uniform in colour or patterned with barring or spots. Sexual dimorphism (visual physical differences between the sexes) – differences in plumage colour and pattern between males and females – is common in the family. Overall the pattern within the family is for the males to have combinations of grey, black or white plumage and the females having buff, rufous and brown colours. For example, the male Dot-winged Antwren is primarily blackish, whereas the female has rust-colored underparts. In some genera, such as Myrmotherula, species are better distinguished by female plumage than by male. Many species of antbirds have a contrasting 'patch' of white (sometimes other colours) feathers on the back (known as a interscapular patches), shoulder or underwing. This is usually concealed by the darker feathers on the back but when the bird is excited or alarmed these feathers can be raised to flash the white patch. Dot-winged Antwrens puff out white back patches, whereas in Bluish-slate Antshrikes and White-flanked Antwrens the white patch is on the shoulder. Their main diet consists of insects, including grasshoppers and crickets, cockroaches, praying mantises, stick insects and the larvae of butterflies and moths. They may also take spiders, scorpions and centipedes. The larger species can kill and consume frogs and lizards as well. They may also eat ruit, eggs and slugs. Antbirds are monogamous. They mate for life and defend territories. The clutch typically consists of lay two eggs laid n a nest that is either suspended from branches or supported on a branch, stump or mound on the ground. Both parents share the tasks of incubation and of brooding and feeding the nestlings. After fledging, each parent cares exclusively for one chick. Nests, including incubating adults, chicks and eggs, are vulnerable to predators, particularly snakes but also nocturnal mammals. Nearly 40 antbird subspecies are threatened with extinction due to hunting or capturing for the pet trade. Their main threat, however, is habitat fragmentation and increased nest predation in habitat fragments. Their songs and calls are generally composed of repeated simple uncomplicated notes.